The influence of the chanson doesn’t always cross easily into British musical sensibilities, which tend to favour a more ironic or cynical approach when it comes to exploring gut-wrenching emotion in song. But occasionally, a singer emerges who revels in the shape and form of an art-form with a commitment that transcends the reservations and embarrassments of tastes that might be more naturally drawn to the bleak introspection and political nuances of folk noir. 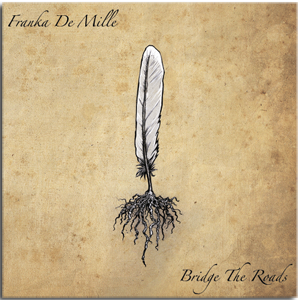 Franka de Mille’s album, Bridge the Roads, delivers such a revelation – a collection of atmospheric, melancholy chansons about separation, longing and atonement which disarm the listener with their honesty. The lyrics don’t dissemble. Cradled by discreet strings, shimmering mandolins and yearning accordions, they spin raw tales of hurt in which the story-teller reaps the consequences of deception – not least in the album’s centrepiece, “Gare du Nord”, which details the devastation of parting with an existential frankness that harks back to Juliet Gréco at her most mesmerising. Fluid and assured, with an underlying catch of vulnerability, de Mille’s voice is the perfect vehicle for a journey that begins with the upbeat, country-tinged incitement to “Come On” and the fiddle-enhanced self-realisation of “Fallen”, before things grow increasingly dark and contemplative with “Solo”, a lament that plays cleverly with the song title. “Birds”, punctuated by a wail of anguish that could come from the heart of the Balkans, later picked up in the visceral pain of “So Long”, is a deeply affecting exploration of a father/daughter relationship. Occasionally, the sun shines through the gathering clouds, hinting at the possibility of healing from these bruising experiences: “Bridge the Roads” itself is a number which sets out the defiant promise of survival and resilience just in time. A complex, rewarding blend of European influences and evocative song-writing. Franka De Mille is one my biggest music discoveries. She is a rising star. Great artist and lovely friend.